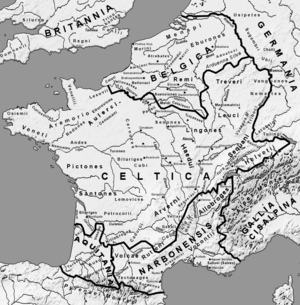 Gallia Narbonensis (Latin for "Gaul of Narbonne", from its chief settlement)[n 1] was a Roman province located in what is now Languedoc and Provence, in southern France. It was also known as Provincia Nostra ("Our Province"), from its having been the first Roman province north of the Alps, and as Gallia Transalpina ("Transalpine Gaul"), distinguishing it from Cisalpine Gaul in northern Italy. It became a Roman province in the late 2nd century BC. Its boundaries were roughly defined by the Mediterranean Sea to the south and the Cévennes and Alps to the north and west. The western region of Gallia Narbonensis was known as Septimania. The Roman Provinces in Gaul around 58 BC; note that the coastline shown here is the modern one, different from the ancient coastline in some parts of the English Channel. The province of Gallia Transalpina ("Transalpine Gaul") was later renamed Gallia Narbonensis, after its newly established capital of Colonia Narbo Martius (colloquially known as Narbo, at the location of the modern Narbonne), a Roman colony founded on the coast in 118 BC. The Romans had called it Provincia Nostra ("our province") or simply Provincia ("the province"). The term has survived in the modern French and Occitan names of the eastern part of the area (French Provence, Occitan Provença), now a région of France. By the mid-2nd century BC, Rome was trading heavily with the Greek colony of Massalia (modern Marseille) on the southern coast of Gaul. Massalia, founded by colonists from Phocaea, was by this point centuries old and quite prosperous. Rome entered into an alliance with Massalia, by which it agreed to protect the town from local Gauls, nearby Aquitani, sea-borne Carthaginians and other rivals, in exchange for a small strip of land that it wanted in order to build a road to Hispania, to assist in troop transport. The Massalians, for their part, cared more for their economic prosperity than they did for territorial integrity. During this period, the Mediterranean settlements on the coast were threatened by the powerful Gallic tribes to the north, especially the tribes known as the Arverni and the Allobroges. In 123 BC, the Roman general Quintus Fabius Maximus (later additionally named Allobrogicus) campaigned in the area and defeated the Allobroges and the Arverni under King Bituitus. This defeat substantially weakened the Arverni and ensured the further security of Gallia Narbonensis. In this strip of land, the Romans founded the town of Narbonne in 118 BC. At the same time, they built the Via Domitia, the first Roman road in Gaul, connecting Gaul to Hispania, and the Via Aquitania, which led toward the Atlantic through Tolosa (Toulouse) and Burdigala (Bordeaux). Thus the Romans built a crossroads that made Narbonne an optimal trading center, and Narbonne became a major trading competitor to Massalia. From Narbonne, the Romans established the province of Transalpine Gaul, later called Gallia Narbonensis. Control of the province, which bordered directly on Italia, gave the Roman state several advantages: control of the land route between Italy and the Iberian peninsula; a territorial buffer against Gallic attacks on Italy; and control of the lucrative trade routes of the Rhône valley between Gaul and the markets of Massalia. It was from the capital of Narbonne that Julius Caesar began his Gallic Wars. The area became a Roman province in 121 BC, originally under the name Gallia Transalpina (Transalpine Gaul). The name distinguished it from Cisalpine Gaul on the near side of the Alps to Rome. In 40 BC, during the Second Triumvirate, Lepidus was given responsibility for Narbonese Gaul (along with Hispania and Africa), while Mark Antony was given the balance of Gaul. Emperor Diocletian's administrative reorganization of the Empire in c. AD 314 merged the provinces Gallia Narbonensis and Gallia Aquitania into a new administrative unit called Dioecesis Viennensis (Diocese of Vienne) with the capital more to the north in Vienne. The new diocese's name was later changed to Dioecesis Septem Provinciarum (Diocese of the Seven Provinces), indicating that Diocletian had demoted the word "province" to mean a smaller subdivision than in traditional usage. Galla Narbonensis and surrounding areas were incorporated into the Visigothic Kingdom between AD 462 and 477, permanently ending Roman political control. After the Gothic takeover, the Visigothic dominions were to be generally known as Septimania, while to the east of the lower Rhone the term Provence came into use. ^ The name is also variously expressed as Narbonese or Narbonnese Gaul, Narbonian Gaul, and Narbonensian Gaul. ^ a b Maddison, Angus (2007), Contours of the World Economy 1–2030 AD: Essays in Macro-Economic History, Oxford: Oxford University Press, p. 41 . William Smith, ed. (1872) . "Gallia Transalpina". Dictionary of Greek and Roman Geography. London: John Murray.